For the average eater, a new kind of hot dog at a fast food restaurant might generate slight interest. For me, it equals therapy. Why do I do this to myself? Why can't I just NOT EAT this stuff? The shrink doesn't have any answers. 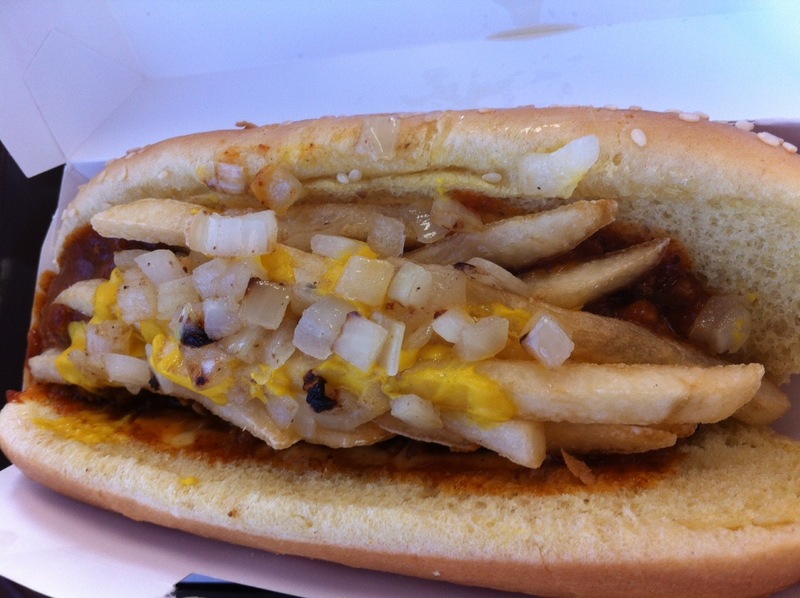 The JYD at the 'schnitz is the standard chili cheese dog plus French fries, mustard and grilled (diced) onions. This is an improvement, mostly because the 'schnitz fries are probably the best, most satisfying item on the entire menu. They're thin, crispy, and not too greasy. They're nice, but a big bite of fries plus this appalling weiner is not a pleasant textural combo. It's yucky. The onions add a little depth of flavor, but not enough to make this thing edible.